The Academy of Motion Pictures Arts & Sciences held an evening devoted to the making of the 1956 sci-fi masterpiece FORBIDDEN PLANET. The evening began with an in-depth exploration of the matte paintings and special visual effects used in this landmark film and the people responsible for that work (several of whom were present and interviewed as part of the evening’s program). Then the focus turned to the sound and music design used in the film. The evening was hosted by two film veterans. Covering the visual effects was Craig Barron, a veteran of Industrial Light and Magic and now head of his own company, Matte World Digital. Barron recently won an Academy Award for his work on THE CURIOUS CASE OF BENJAMIN BUTTON and has worked on such groundbreaking films as RAIDERS OF THE LOST ARK, THE EMPIRE STRIKES BACK, E.T. THE EXTRATERRESTRIAL, ZODIAC, ALICE IN WONDERLAND, and the upcoming CAPTAIN AMERICA: THE FIRST AVENGER. He was nominated for an Academy Award for his work on BATMAN RETURNS. Our other host this night was sound designer, editor and mixer Ben Burtt. Burtt received Special Achievement Awards for the creation of alien, creature and robot voices featured in the original STAR WARS, as well as his sound effects editing on RAIDERS OF THE LOST ARK. Burtt won Oscars for his work on E.T: THE EXTRATERRESTRIAL and INDIAN JONES AND THE LAST CRUSADE. Burtt has more recently worked on such films as WALL-E, STAR TREK and SUPER 8. This was an incredibly fun and informative evening. It was, in many ways, a revelation. This was followed by a digital screening of FORBIDDEN PLANET, which I have to say looked absolutely amazing. I was concerned about seeing a digital presentation versus an actual film print, but the image looked amazingly film-like with grain intact, rich, deep blacks, and a natural clarity that defied its projected source. 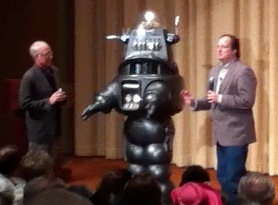 And then, the surprise moment of the evening, Robby, The Robot, made one of his first public appearances in nearly 50 years. Yes, this was the actual Robby, not a recreation. Fully functional and in quite good spirits. I shot some footage of Robby’s “interview” below. Enjoy. Thanks to the Academy for putting together such an incredible evening. All with a price tag of a mere $5. Saturday nights don’t get much better than this for film lovers.